Earlier in the week I complained about house prices in Toronto. I've just discovered that you can in fact still buy a house in Toronto for under $200,000. 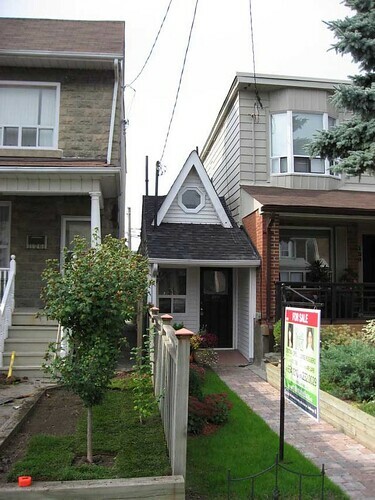 In fact, a charming little home near St. Clair and Dufferin is going for only $179,900. It's the smallest house in the city, built on a driveway. For many young families, this is the only affordable piece of real estate in the city. There are probably some half-million dollar condos for sale downtown with less square footage than that...um...house. Oooo Oooo, I wanna live there. It's perfect for a bachelor. Very quaint & neat! I was already linking to the MSL listing! The house is on Day Ave. in T.Dot. Seen it many times. It is close to my place, I have seen this house.... it is so small sometimes people think this is a shed.